The Winery Dogs have shared a short tour documentary showcasing the band’s performance in Mexico City from earlier this year. 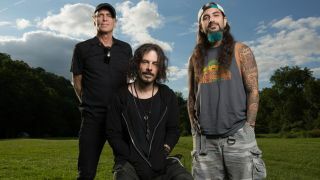 Singer and guitarist Richie Kotzen, bassist Billy Sheehan and drummer Mike Portnoy were on the road in May in support of the trio’s second album Hot Streak. And in the clip, filmmaker Nico Merkin follows the band around the city, showing them onstage, meeting fans and conducting promotional work. Reflecting on what makes The Winery Dogs tick in the clip, Kotzen says: “It’s an interesting combination. Billy has a way of playing the bass that’s very unique – he incorporates the kind of lines on the instrument that a bass normally wouldn’t do. “Because I sing, every move that I make when I write is, ‘How can I sing over that? What’s the melody?’ I look at it from that angle so it kind of keeps things in a more basic format. The Winery Dogs have no plans for the remainder of 2016, although Portnoy continues to have a number of projects on the go. He recently announced that he’ll perform Dream Theater’s Twelve-Step Suite at next year’s ProgPower USA. Portnoy and The Neal Morse Band are gearing up for the launch of the album The Similitude Of A Dream, which will be released on November 11.